Opus Dei, the Work of God: A Church within a Church? The successful novel The Da Vinci Code by Dan Brown has raised public interest in the controversial Catholic lay group Opus Dei, depicting it as a sect focused on wealth and power. As part of the BBC's Who Runs Your World? series, the BBC's Max Seitz travelled to Spain - the country where Opus Dei was founded and seems to be most influential. Opus Dei - which in Latin means "Work of God" - has been accused of manipulating its followers, but denies all such claims. People on the streets of the Spanish capital, Madrid, told me that they believe Opus Dei is a secret society which has infiltrated politics and businesses. "Opus Dei has a lot of power in Spain, and it's also influential in other countries," one person told me. "There are lots of things we still don't know about them - they just let us know what they want," said another. "Opus Dei is a powerful organisation which uses its schools and universities to grow more influential." But what's the truth behind this perception? Is Opus Dei as powerful as people think? This Catholic group claims around 85,000 members around the world, one third of them in Spain. Members are encouraged to promote the evangelising mission through their professional work. In other words, they aim to be very successful in their jobs while at the same time being charitable to other people and trying to attract more followers. In 2002, thousands of pilgrims from around the world travelled to the Vatican when Pope John Paul II canonised the founder of Opus Dei, Josemaria Escriva de Balaguer, in a "fast track" process only 27 years after his death. He also granted Opus Dei the status of "personal prelature" - which has given the group some independence within the Catholic Church. 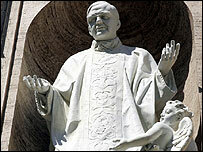 That is why some say that Opus Dei grew more influential in the Vatican during the papacy of John Paul II. But Opus Dei's spokesman Jack Valero denies it: "The number of people from Opus Dei working in the Vatican is very reduced: five or maybe six people, including the spokesman Joaquin Navarro-Valls. 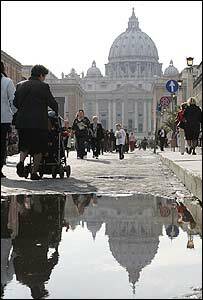 The influence of Opus Dei in the Holy See has been exaggerated." But critics say there are more clergymen with links to Opus Dei, and that they have created a "Church within the Church", something that the Catholic group denies. Opus Dei has also had prominent representatives among governments and companies, although they usually do not publicly recognise their membership. The Spanish sociologist Alberto Moncada - himself a former Opus Dei member - explains that the link between Opus Dei and power could be traced back to the 50's, when two representatives of the group were appointed ministers during General Franco's regime. "Franco's regime was a period of political and economic success for Opus Dei, but at the same time has given the group a bad name," he said. "People still remember this old time. However, things have changed. Although some members of Opus Dei are active in politics and businesses nowadays, they don't act together like a mafia. That's not true." The UK education secretary, Ruth Kelly, has recently confirmed reports that she is a member of Opus Dei. In Latin America, Colombian President Alvaro Uribe is also said to be a member - something he has not confirmed. Opus Dei's spokesman Jack Valero says religion is something that should be kept private. "Opus Dei membership is a private matter," he said. "We don't publicise our members list. Some high-profile politicians say publicly that they belong to Opus Dei, yes, but that's not relevant to their job as government officials or congressmen. What's really important is how they do their job." It is difficult to pin down just how much money Opus Dei has. The group is decentralised into scores of foundations around the world, and it does not publicise its general accounts. Members have to donate a significant part of their income. But maybe the most overlooked aspect of Opus Dei's power is that it is said to wield over its followers. Accusations have been made of brainwashing and manipulation in centres where celibate members live, the so-called "numeraries". 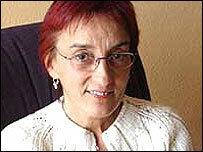 "Life is schizophrenic in Opus Dei centres," says former numerary Carmen Charo. "Each member has lots of spiritual tasks to fulfil, like praying, going to mass every day, training other followers, and his or her development as a free person isn't really considered - one is always under the orders of the spiritual leaders, and also under their strict control. The same happens with your money." Members of Opus Dei respond to these criticisms by saying that they are normal people working in the midst of the world just like anyone else, and that they are free and can leave whenever they want. "It's a vocation," says Jose Maria Villalon. "You can freely choose your way of life and I have chosen to find God in my work as a member of Opus Dei. "Someone within the group could have made some mistake, even myself. That's normal in any organisation run by human beings. However I completely deny that people are manipulated or brainwashed." So are Opus Dei members saints or sinners? Many in Spain say the answer lies somewhere in between.